Judith Beveridge launched Signal Flare by Anthony Lawrence (Puncher & Wattmann) at the Friend in Hand Hotel on 14th October 2013. 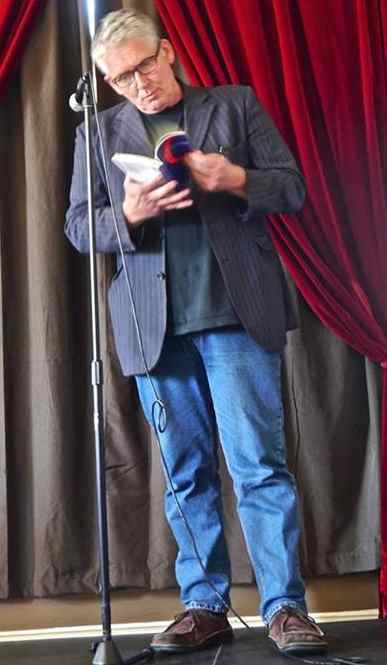 Anthony Lawrence reading at the launch of Signal Flare (Photo Robert Adamson). I’m deeply honoured to be launching Anthony’s new book Signal Flare today. As is usual with Anthony’s work, there are great treasures and riches on every page. Anthony‘s poems reward you every time you go back to them. And I go back to Anthony’s poetry a great deal. Over the years I have found the poems to be inspiring, sustaining, provocative, awe-inspiring, far-reaching, beautiful, wildly imaginative, yet also very grounded in emotion. I know that when I read a poem by Anthony Lawrence I’m going to be taken somewhere transformative and unique. I know that something within me is going to be activated and enlarged. Wallace Stevens talked about the power of the imagination to transform reality. He is famous for saying that poetry ‘helped people live their lives’. By this I think he meant that poetry can change our perceptions and help us escape the numbness of habit and daily routine. We need the poet’s eye to explore, to celebrate, to make the familiar extraordinary and to make space for the inner life. Anthony’s ability to keep his readers, and also himself, in a state of wonder and amazement, is one of his great specialties. sparking and shorting-out in the wash.
from a four-chambered engine room. Orb spiders lie cruciform on nets they have thrown. above the poised, furred joinery of their legs. along with the lacework of dead leaves. and carry cupped-flame from room to room. as the rain dies away like forced applause. You can see how the details have a sparkling precision and make us see things in an enlarged and energised way. Something revolutionary occurs, I believe, when the poet, through exploration and invention, discovers the images and metaphors, the rhythms and sound patterns which open up and reveal a new set of meanings. Anthony’s poetry is remarkable for this. I’ve always enjoyed the way that Anthony integrates observation with thought and reflection, so that his poems are never just descriptive, but they open up vistas and perspectives, simultaneously linking and activating many assumptions and ideas. from some distant, lofty place. some way towards revealing you? the heavy consonants of grief. In a poem, I always look at the poet’s ability to capture a number of extras, or windfalls. Anthony‘s poems are full of bonuses, because he pays painstaking attention to craft. He is able to garner much from his syntax, his rhythms, his lineation and his stylish and sure-footed metaphors. He is able to modulate his voice in ways that are both casual and intense. I think with this volume, there’s no question that the level of astute attention that he as given to craft has gone up a notch: each line break has been carefully thought out, each move serves the poem. There are so many aspects which have been so expertly calibrated. Anthony often runs his sentences over many many lines, yet he never loses control; the branching or architecture, the flow of the sentences across the lines are simply masterful; he beautifully settles the weight and drift of the cadences in ways that are satisfying and surprising. Though his sentence constructions are often complex, his use of the line disencumbers any heaviness that might be produced by a build-up of phrases and clauses. A great part of the effect of Anthony’s poems is achieved through the balancing and positioning of the thoughts over the lines; each line will let a poem run out a little further on its syntax, shaping the pulse of thought: This is especially true of the very first poem in the book ‘Lines in Absentia’. In Signal Flare Anthony’s voice is still seasoned with lyrical, dramatic and narrative impetus, but it’s also a book that is more graceful and enterprising, perhaps more of a book of mood, of memory, past and present. Though it startles with its agile, daring, off-centre imagination, it still has tenancy in the extrinsic world and has strong emotional coherence built from the layering of finely crafted lines. It is obvious that Signal Flare has a grandeur of language and thought that must surely have been hard-won. It also attests to Anthony’s courageous and compelling consciousness and his remarkable ability to work his material extensively and ambitiously. This entry was posted in Anthony Lawrence, Issue 10, Judith Beveridge, Puncher & Wattmann, Signal Flare and tagged Anthony Lawrence, Australian Literature, Australian poetry, Judtih Beveridge, Wallace Stevens, William Carlos Williams by Mark Roberts. Bookmark the permalink.